There’s old school fighters, and then there’s really old school fighters. Brooklyn’s own Paulie Malignaggi is now a really old school fighter. For the retired two division belt holder has signed on with an organization called the Bare Knuckle Fighting Championship, the nature of whose business can be found in its very name – bare knuckle fighting. The 36-8 Malignaggi last laced up the gloves for a professional fight in 2017 when he was stopped by Sam Eggington in England. He’ll be fighting again this year, however, just without the gloves. The date of Malignaggi’s first bare knuckle brawl has yet to be announced. Malignaggi, one of the sport’s more colorful individuals, is 38 years of age. Bare knuckle boxing once dominated the landscape. Figures like John L Sullivan ruled the sporting scene of the late 1800s by engaging in grueling affairs like Sullivan’s seventy-plus round brawl with Jake Kilrain in 1889. After Sullivan was met and bested in September of 1892 by a younger, slicker James J Corbett, in the first heavyweight gloved fight, the bareknuckle era found itself down for the count. Until, apparently, now. Should he prove successful in this endeavor, Malignaggi will arguably be the first well known bare knuckle brawler since Benjamin Harrison was President of the United States. Word has yet to arrive as to whether or not Malignaggi will begin sporting a handlebar moustache. Best known as a top fighter who prowled the welterweight and junior welterweight divisions, Malignaggi won the IBF junior welterweight title and the WBA welterweight title, respectively. Throughout this ring career, Malignaggi faced off against a who’s who of big name competition. Miguel Cotto, Ricky Hatton, Amir Khan, Adrien Broner, Danny Garcia, Shawn Porter, and Zab Judah were all Malignaggi opponents at one time or other. Malignaggi has fairly recently earned a reputation as a top level broadcaster for Showtime Boxing and Britain’s Sky Sports, where his in-depth, experienced knowledge of the fight game, coupled with his fast talking, intelligent style have made him a popular figure. Malignaggi engaged in a highly publicized feud with Conor McGregor in 2017 after he agreed to help train the Irishman for his boxing match against Floyd Mayweather, only to find video footage of himself appearing in a less than flattering light made public by McGregor’s team. Since that time, Malignaggi has largely stuck to broadcasting fights, though he recently could be seen working in James DeGale’s corner during the super middleweight’s bout against Chris Eubank Jr.
McGregor and Malignaggi in Talks? Could Conor McGregor be making a return to boxing this year? Rumors are starting to spread in the UK and Ireland that suggest it may be likely. Several boxing and MMA sites have said they have it from credible sources that discussions about a McGregor v Paulie Malignaggi fight have begun. The Sun newspaper today announced that the pair were in talks. There has been a long running feud between the two fighters, ever since footage was leaked of a McGregor-Malignaggi sparring practice in the build up to the McGregor v Mayweather bout in 2017. In the footage it appeared Malignaggi had been floored by McGregor, this was dismissed by Malignaggi, who claims he was pushed. He then left McGregor’s training camp and has continually took to social media to vent against McGregor and his team. McGregor returned to the UFC and was soundly defeated by lightweight champion Khabib Nurmagomedov, submitting in the 4th round. Before this bout it was reported that McGregor had signed a multi fight deal to compete on the UFC. 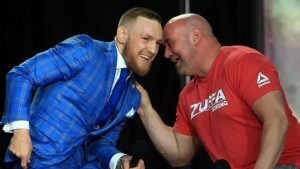 Could the fight take place as part of a Zuffa Boxing promotion, a move Dana White, the UFC President has mooted in the past. The UFC also made moves into boxing by recently signing a deal with Roy Jones Jr Boxing Promotions to show events live on UFC Fight Pass. Whether this fight comes to fruition, time will tell. Is it a fight boxing aficionados would savour? I doubt it. sub-narrative raised and incubated by a facially grazed Paulie Malignaggi this past week, is a timely reminder that surreal as this event is, there is actually a very real final outcome. The debate has exclusively swirled around the validity of the encounter between the world’s greatest living boxer and the world’s most significant mixed martial artist, whilst the cartoon verbal violence has dazzle-shipped the real violence out of the conversation. Whatever the validity of their ultimate sharing of a boxing ring, in gloves of as yet confirmed ounce weight, this will be a real and physical encounter between two real athletes who will be trading real punches that cause real damage. Combat sports, whatever their rule set, are no joke. Just because Conor McGregor looks like a glistening avatar who has just stepped out of Xbox gameplay. And just because Floyd Mayweather is a walking talking brand experience doesn’t mean that the night of August 26th is a live video game streaming for the amusement of the Black Mirror generation. There is a fight coming and there are ongoing preparations to be made. It is a testament to his confidence and loyalty that McGregor has largely surrounded himself with his usual training team, helmed by Head Coach John Kavanagh and Striking Coach Owen Roddy. The broader Team has included sparring partners in Irish amateur phenom Tiernan Bradley, journeyman professional yet noted spar-hand Dashon Johnson and unbeaten London welterweight Louis Adolphe. But it was the simmering addition of former world champion and seasoned campaigner Paulie Malignaggi that has caused real intrigue, insight and inquisition this past week. The recently retired Malignaggi could have actually been an ideal addition to the Las Vegan leg of final preparations bringing experience, craft and a forensic analytical approach to the sport, but from the off the whole thing felt, off. Back in December 2016, McGregor was granted a boxing license in California with that news met with a mixture of negativity, amusement and bristling anger by the boxing community. “Who the f*ck is that guy?” was Conor’s reply at an Irish Q&A event days later. Fast-forward to the early summer of 2017 and Mayweather boxing McGregor at a catchweight of 154lbs is confirmed for 26th August 2017 at the MGM Grand Las Vegas. Los Angeles. Toronto. New York. London. Forget tapping into Paulie’s experience, craft and analytical skills then – this was McGregor looking to reprimand Malignaggi on his turf and in tough terms. Since his London defeat to Sam Eggington on the undercard of Tony Bellew’s feature attraction with David Haye back in March, Paulie Malignaggi has gone from being the part time Magic Man to the full time Media Man and good at it he is too – but magic is one thing pure illusion is another. Yet still he returned for more. Of course he was. In fact, not so much set up as he served himself up. Team McGregor’s next move was the Instagram posting of images which showed the American on the canvas in what appeared to be a knockdown. “It’s all about his status, he’s a scumbag.” Malignaggi told the MMA Hour Podcast. “He pushed me down during one of his worst rounds.” He continued by way of addressing the images of him downed. This interview being the most comprehensive of what had been a Malignaggi Media Tour to rival the global MayMac endeavour, where he appeared on pretty much any platform that would have him to reiterate amongst other things that he was pushed down. Now at least edited once it is, but Dana White’s subsequent release of around 10 seconds of sparring footage clearly shows McGregor connecting and Paulie falling. There was no push, a punch put Malignaggi down and he is one Uomo Duro or he certainly once was. Now we know this is all part of the broader promotional galaxy. There are lots of things orbiting. There are lots of layers. The narrative has to be driven and driven hard right up to the final moment of PPV click commit. But there is ultimately a fight in August at the heart of all this thoroughly modern Sportstainment. Malignaggi had his own agenda too. No problem. But savvy as he is and as keen as he is to align himself to the McGregor freight train, it was obvious what was coming and the level of his surprise gives credence to Conor’s suggestion that he left the camp with head trauma as well as a bruised ego and grazed face. …Don’t forget that as American playwright David Belasco once said, “Boxing is show business with blood.” – We’ve had the show business and soon there will be blood. For that, there has to be respect. In what should come as a surprise to no one, former two time boxing titlist Paulie Malignaggi is at odds with the Conor McGregor camp. McGregor, who is in training for an extremely lucrative novelty boxing match with retired pound for pound king Floyd Mayweather, had brought on Malignaggi as a sparing partner – at least ostensibly. Now, however, it appears to Malignaggi at least that McGregor wanted to “exploit” the popular fighter/television announcer for his own aggrandizement. 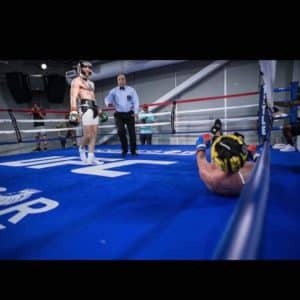 Pictures have emerged online of McGregor seemingly getting the better of Malignaggi in the ring, pictures which Malignaggi claims tell a false tale. That, frankly, is not likely to happen, at least not until after the fight between McGregor and Mayweather goes down on August 26th. In the meantime, Malignaggi has left the McGregor camp – and clearly not on good terms. “Hate to say it,” Malignaggi tweeted, “but it’s clear when I look back at my time there that there was an agenda from the start, too many clues.” If Malignaggi was, in fact, set up in all of this, it comes to some as no surprise. The popularity of McGregor rests largely on his ability to appear as a less than respectful loud mouth. His abrasive – some would say antisocial – antics are as much a part of the man’s reputation as are his skills in the octagon, the aptly named fenced in area where most MMA bouts are held. Oddly enough, abrasiveness is a major selling point in what many believe is more a pop culture event than a legitimate sporting contest. 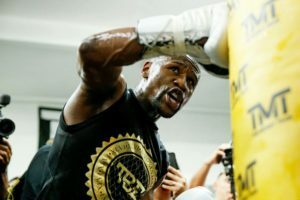 Mayweather has mellowed in recent years, but he was – and remains – a household name in part by engaging in obnoxious, over the top rhetoric. It’s a tactic McGregor has taken hold of in his own combat sport and run with – to enormous success. Now both men may well earn nine figures a piece for their showdown, which many feel will not be competitive, as McGregor has never once engaged in a professional boxing match. Both the Mayweather and McGregor camps, however, have been trying to sell the public on McGregor’s chances in the ring later this month. Not that the public needs to be sold. McGregor has an enormous, nearly cult-like following in awe of his abilities, whether those abilities are merely perceived or are, in fact, real. It’s arguable that most everyone else interested in the bout, however, views it more as a spectacle than as a sporting contest or are simply unaware of the differences between a boxing match and a mixed martial arts contest. In short, Malignaggi’s public airing of his grievances may only add to hype. Last week, MMA-star Conor McGregor was granted a boxing license by the California State Athletic Commission, allowing him to box professionally in California. This as an alternative to chasing big-money fights in Las Vegas, for which he would need a Nevada boxing license, a license which the Nevada State Athletic Commission has denied. 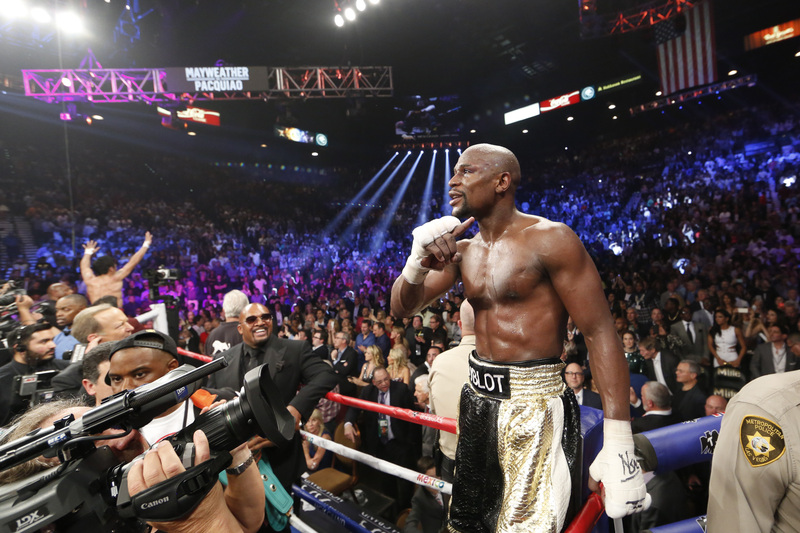 Immediately, speculation turned to a fight between McGregor and Floyd Mayweather Jr. This despite Mayweather not fighting in 2016 and not being a serious contender on any current pound-for-pound top ten. But he is still the biggest draw in boxing, and the zero in his 49-0 record is an attractive target for someone like McGregor who wants to make an immediate impact in the sport. McGregor has called Mayweather out before. Conventional wisdom has been that Mayweather waits until an opponent is at his weakest to accept a fight, here, the 28-year-old McGregor is at his weakest right now—before he’s had time to acclimate to boxing. Every MMA fighter’s problem when moving to the squared circle is the significant stylistic differences between MMA and boxing. The stance is more upright in boxing, and MMA fighters who transition to boxing need to learn how to stand up. The guard is different—in boxing, hands are held high to defend the head. Boxing also places heavy reliance on blocking, whereas MMA barely allows for blocking due to the smaller gloves, which allow even blocked strikes to land. There’s different footwork as well—MMA fighters keep wider, lower stances to help avoid takedowns. Finally, the punching motion itself is different (torqueing the hips). None of this speaks to strategic differences—for example, boxers understand that body work is a long-term strategy to winning by decision or late kayo. For McGregor, the path to Mayweather, if there is one, should be through an established fighter he believes can’t hurt him. Enter Paulie “The Magic Man” Malignaggi. If McGregor can box (he was a youth boxing champ in Ireland), Malignaggi is a good choice for a first fight. He’s never had power, compiling a 36-7 record with only 4 knock-outs. At 36, Malignaggi is the slowest he’s been in his career. But he’s scrappy and has had a good enough chin to go the distance. He’s also riding a three-fight winning streak, and is one of the better known boxing names in the general sports world. The fight would draw viewers, would test McGregor’s stamina, and is unlikely to pose a knock-out risk. Maybe McGregor will actually take the bait and fight Malignaggi. It would be a good move—safe but notable, and lucrative. If so, it will be an interesting test of McGregor’s foray into the sweet science. And if he wins convincingly enough, but not too convincingly, he might just be able to draw Mayweather out and get a big payday against the biggest Money fighter of them all.